Since October 2014 I have been Musical Director of The Birchpole Singers, which has a Facebook page. Photos from choir concerts can be seen on the Facebook page, including some from the recent concert on June 30th at Richards Castle. We put on four or five concerts each year in local Herefordshire churches as well as in our home base of Yarpole. Do get in touch if you would be interested in hosting a concert. The format of our concerts is usually that we give the opportunity to a young vocal or instrumental soloist to perform some items - with myself as accompanist - in between sets of choir items. This seems to go down very well with both the choir and the audience, and is also of course a good opportunity for the young soloists themselves. At our concert in June 2016 Archie Auger (flute) performed the Poulenc Flute Sonata, In Ireland by Sir Hamilton Harty and Hypnosis by Ian Clarke. In December 2016 Archie again performed, but this time on bassoon. He played pieces by Weber and Grovlez. At the recent concert in June 2017 Oran Johnson performed the slow movement of Beethoven's Piano Sonata in C minor, Op 10/1 and then in the second half pieces on trombone by Rimsky-Korsakov and Irving Berlin. The Birchpoles also perform contemporary music. 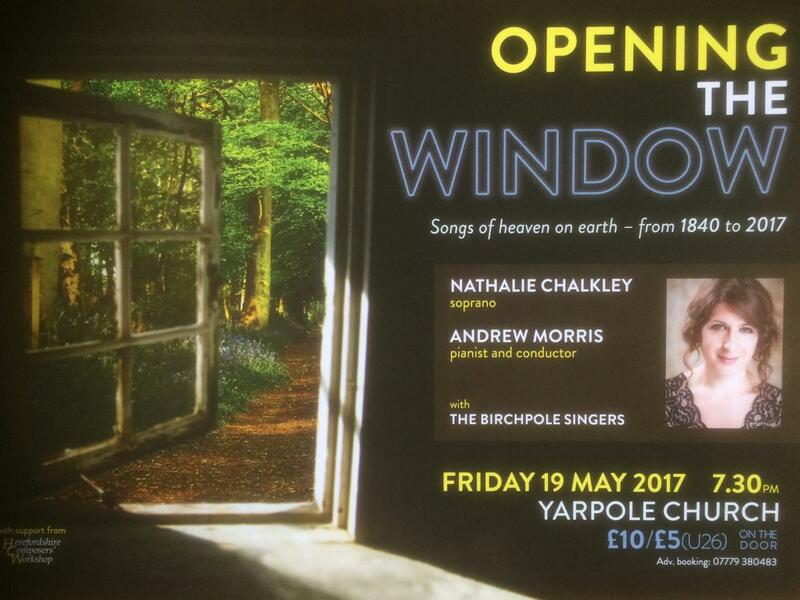 In May 2017 the Birchpole Singers perfomed three works by HCW composers in a concert featuring the soprano soloist Nathalie Chalkley. Robert Peate's Snail Litany was written specially for this occasion and received its premiere performance with Rachel Voysey as the soprano soloist. Gary Higginson's A Bishop's Prayer and my own Apple Tree Hymn were also performed. In the June concert, the choir also performed for the first time two of the Gospel numbers from Mike Sheppard's book of new Gospel compositions, Sing Glory. If you know anyone who is looking for a choir to join, do get in touch. Our rehearsals are at Yarpole Church on Wednesday evenings and will begin again after the summer break on September 13th. The Birchpole Singers are a community choir based in North Herefordshire. The name comes from the two villages of Bircher and Yarpole. Founded in 1981, the group continues to sing and perform a mixture of classical, folk, pop, sacred and secular music. Our current Musical Director, Andrew Morris, and current Chair, Nancy Morgan, lead us as we practice in Yarpole, Herefordshire and perform in the surrounding region.